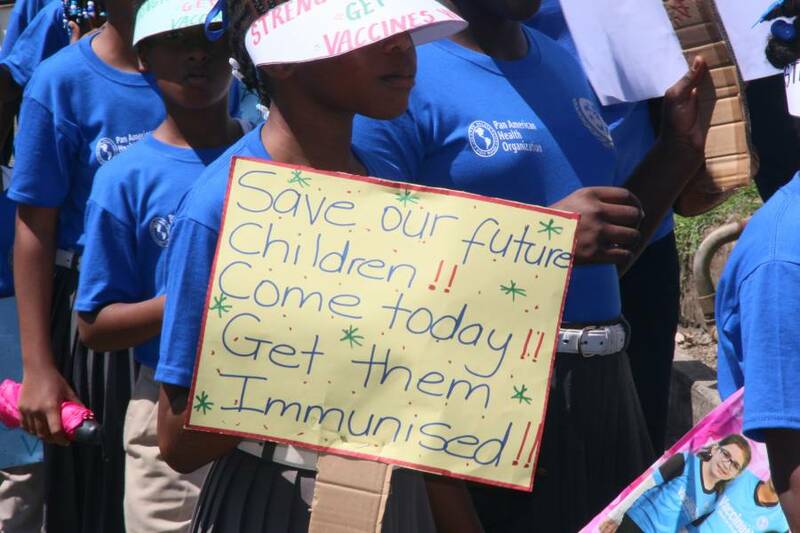 A street march with students, teachers and healthcare providers promoting the benefits of immunisation brought the curtains down on activities marking Vaccination Week in Grenada. The march, which took place through the streets of Gouyave, was organised by the St John/St Mark Health District activities and ended at the Cuthbert Peters Park, where the official closing ceremony was held to award health districts that engaged in activities aimed at further strengthening the Expanded Programme on Immunisation EPI. Senior Community Health Nurse, Carol Telesford-Charles, Grenada’s (EPI) manager was the main speaker at the award ceremony who commended and encouraged her nursing colleagues to keep-up their good work. She highlighted some of the benefits of vaccination and the fact that Grenada continues to lead the way when it comes to the execution of the (EPI). Telesford-Charles also singled out the Carriacou and Petite Martinique health district for winning the top award for the Highest Vaccination Coverage for the second straight year. The second award went to the health district of St Andrew while St John/St Mark took the third spot. During the just concluded observation included street marches, immunisation poem competitions, quiz for mothers and clients, as well public and media engagements. Two other activities, a jingle competition at Boca Secondary School and a village march will take place next week in St George and St David respectively. Meanwhile, in 2016, Grenada embarked on the implementation and continued use of an electronic immunisation registry, which is designed to make the implementation of the EPI as seamless as possible. To date, with the approval and sanctioning of the Pan American Health Organisation (PAHO) Grenada through the Ministry of Health has been providing training and guidance on the implementation and use of the digital system to PAHO member-states.